Check this page regularly for updates on news, events, and anything else of interest during Disneyland's big birthday weekend. "He did see this; that's why it's here"
Some people have commented that they were really touched by the speech that Art Linkletter made today at the 50th Anniversary Ceremony. One element of the ceremony this morning was the addition of politicization. When he came to the stage, Schwarzenegger was booed by some and a small group quickly unfurled a banner that they had sneaked into the park. We were unable to catch what it said (but something about unions or teachers is likely) before the group was ushered out by security. To be fair, it was just on that side, but Schwarzenegger's speech also sounded more like something from the campaign stump than wishing Disneyland a happy birthday. Frank Anzalone was photographing the ceremony, below are a selection. 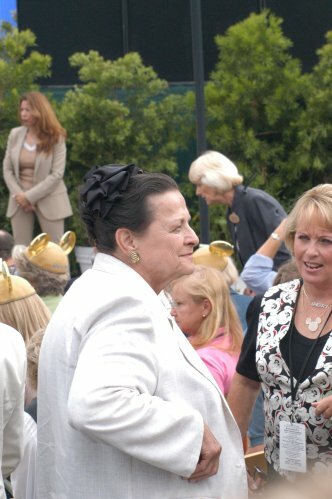 Alice Davis in the crowd before the ceremony. Photo by Frank Anzalone. Trying to see everything. Photo by Frank Anzalone. 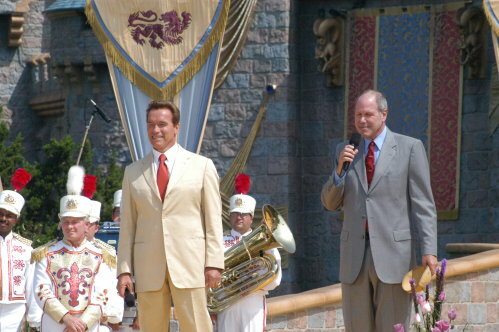 Arnold Schwarzenegger and Michael Eisner. Photo by Frank Anzalone. 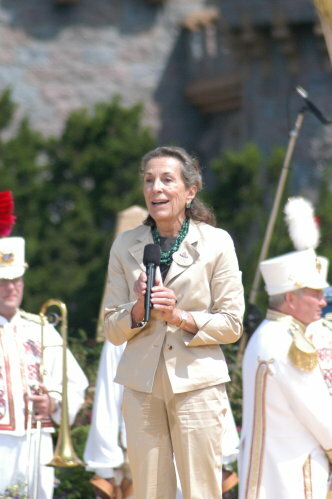 Diane Disney Miller, the representative of the Disney family attending the ceremony. Photo by Frank Anzalone. Madison and Mary, the first guests into the park. Photo by Frank Anzalone. 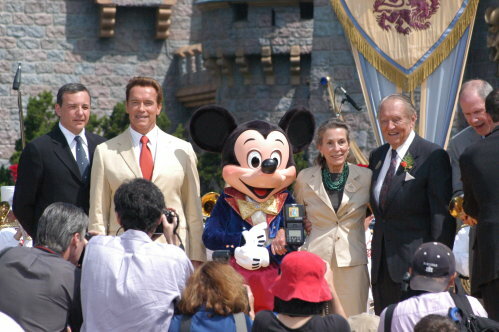 From left to right: Robert Iger, Arnold Schwarzenegger, Mickey Mouse, Diane Disney Miller, Art Linkletter, and Michael Eisner. Photo by Frank Anzalone. Art Linkletter giving his presentation. Photo by Frank Anzalone. The Fab Five on stage with the Disneyland Band. Photo by Frank Anzalone. Fireworks at the end of the ceremony. Photo by Frank Anzalone. After the ceremony, a young boy gathers up confetti. Photo by Frank Anzalone. This custom motorcyle was presented to Arnold Schwarzenegger, who will auction it and donate the proceeds to charity. Photo by Frank Anzalone. 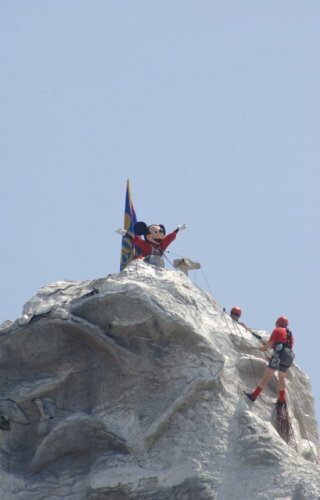 Following the ceremony, Mickey Mouse made his climb of the Matterhorn and planted the 50th Anniversary flag. Photo by Frank Anzalone. 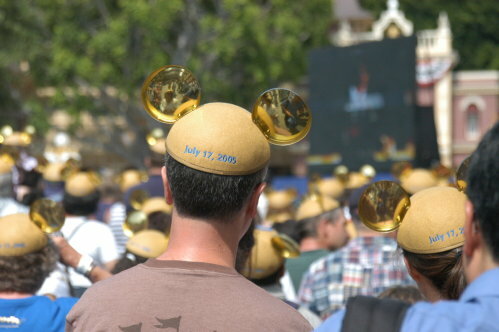 A little after 10:00 a.m. today, Disney began its official 50th Anniversary Ceremony celebration. The event began with Art Linkletter recounting his time with Walt Disney. Linkletter explained that although his nametag said he was from the class of 1955, that in truth, he got to visit the orange groves with Disney two years previously when they were looking at the land on which Disney planned to build the park. Linkletter then introduced Disney President and CEO-elect Robert Iger, who welcomed everyone to the celebration. 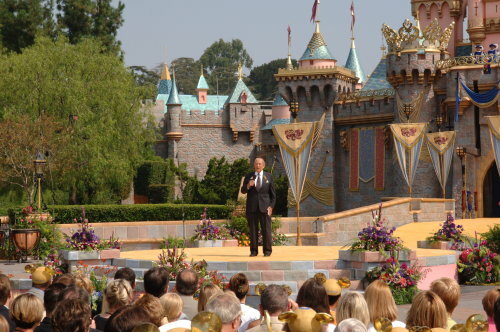 Disney CEO Michael Eisner then took the stage, after which he introduced California Governor Arnold Schwarzenegger. Schwarzenegger spent a few minutes talking about the magic of Disneyland, as well as how much Disneyland contributes to the economy of the state. 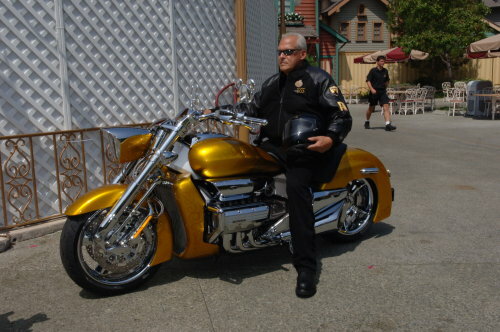 Eisner presented Schwarzenegger with a one-of-a-kind golden Honda motorcycle. Eisner announced that the motorcycle would be sold on auction, with the proceeds going to Schwarzenegger's After-School All Stars program. After all the speeches, it was time for Eisner to introduce Diane Disney Miller, the daughter of Walt Disney. Miller said that she was not in attendance on opening day, because her father thought it would be too crowded and unfit for his wife and two daughters. Eisner then asked Miller to give the original speech that her father made when he welcomed the world to his new park in July 17, 1955. Miller then began, "To all who come to this happy place, welcome..."
With that cue, the image of Miller on the large monitors placed throughout the park was slowly replaced by an image of her father, Walt Disney, as he gave his original speech. At the end of the short speech, the Fab Five (Mickey, Minnie, Donald, Goofy, Pluto) came out from the castle entrance with the marching band behind them. Mickey led everyone on a rousing rendition of "Happy Birthday" with all the park guests wearing their special golden Mickey ears. A large flock of doves were released at the end of the ceremony, followed with daytime fireworks. Random photos during the 10 a.m. ceremony. Near the end of the merchandise line. These people near Haunted Mansion are waiting to get into the Festival Arena behind Big Thunder Mountain Railroad. Photo by Adrienne Vincent-Phoenix. 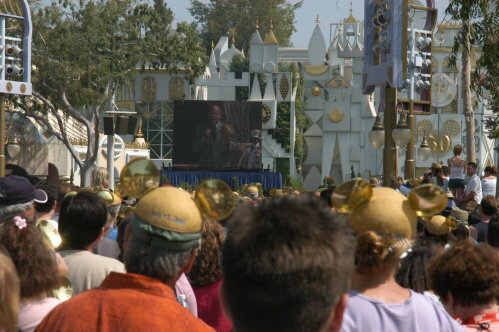 A crowd near "it's a small world" watches the ceremony on a monitor. Photo by Adrienne Vincent-Phoenix. Watching the ceremony from Main Street. Photo by Adrienne Vincent-Phoenix. The crowd around the Central Plaza (Hub), watching the ceremony. Photo by Jeff Moxley. 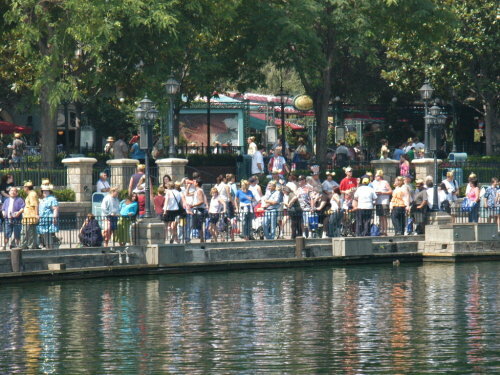 Also, as of 10:00 a.m., the park has reached about 50% of capacity. Squeezing in a chance to get some photos up. 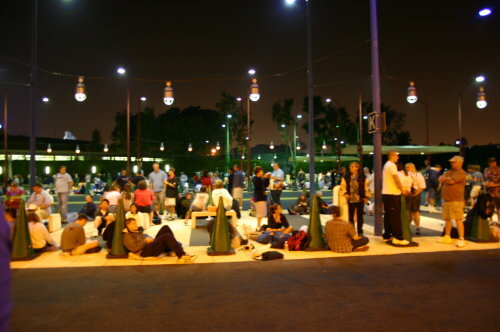 People waiting in the tram loading area to get into DCA around 3 a.m. Photo by Jeff Moxley. 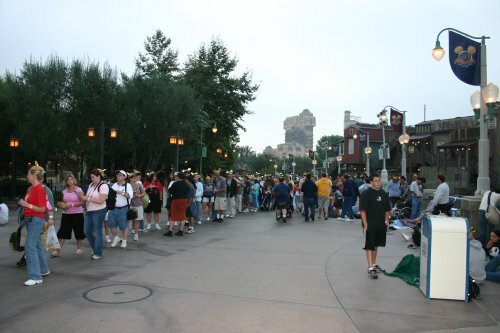 The first people into the park, waiting for rope drop. Photo by Adrienne Vincent-Phoenix. 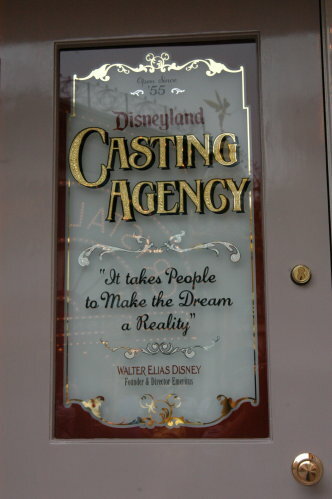 The new window on Main Street, dedicated to Disneyland cast members. Photo by Adrienne Vincent-Phoenix. Disneyland Resort President Matt Ouimet worked his way around cast members before the day's onslaught. Photo by Adrienne Vincent-Phoenix. 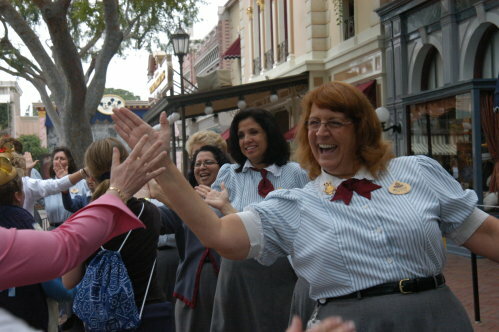 A cast member welcomes everybody home. Photo by Adrienne Vincent-Phoenix. Main Street is almost totally full with park guests waiting for the anniversary ceremony to start. 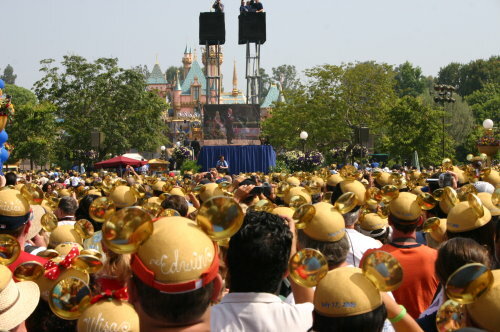 Almost everyone is wearing special golden mouse ears, and the sun has broken through the clouds. Approximately eighteen gazillion people here in the esplanade with lines to enter Disneyland stretching back to DCA gates. 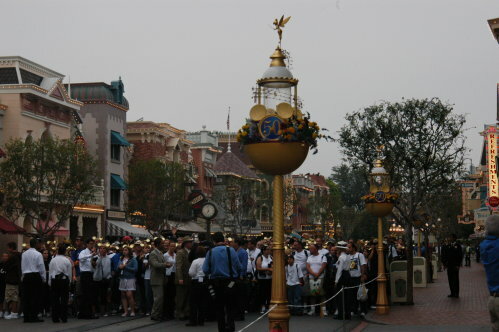 Security has paused allowing guests into the area until Disneyland`s gates open. Disneyland Park President Matt Ouimet moments ago walked to every single entrance gate to shake hands and personally thank all the cast members. In the meantime, guests entering the park are being greeted by choruses of "Welcome home" from cast members. When thousands of people are going to descend on Disneyland before the crack of dawn to ensure entry into Disneyland for its 50th anniversary date, how early do you show up to be first in line? The official first person in line is Madison, a teenager from Greenwich, Connecticut, who got in line by 3:00 p.m. in Downtown Disney after talking to cast members about where to wait. She was moved a few times before she was allowed to stand in Disney's California Adventure park at 2:00 a.m.
For those who didn't make it into DCA, the line is long as well. The Downtown Disney line goes all the way back down to the monorail station and most of the way back to the security checkpoints. The mood in line is high, with nobody upset at the prospects of another hour or two in line. Though we're getting some looks for the laptops, cameras, and cellphone keyboards we're using to get these updates posted. Part of the line near Golden Dreams. Photo by Alex Stroup. 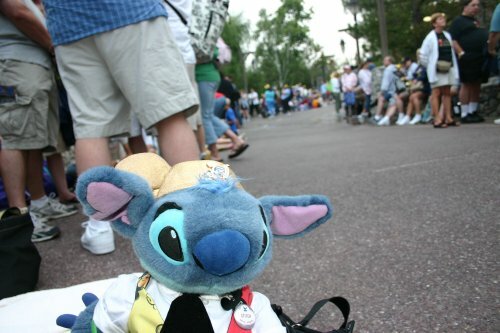 Lani's Stitch is dressed for the occasion and takes his place in line. Photo by Alex Stroup. It is now 6:40 and they've announced that they've begun moving people over to Disneyland and will do so in 9 groups based on the color of wristband worn. I suspect we've the 9th color (black and white checked, not so fun as the fluorescent jigsaw puzzle ones). Estimates are that by 4:00 a.m., there were over 10,000 people in the queue in Disney's California Adventure park to get into Disneyland. By 6:00, the line grew to an estimated 18,000 to 20,000. The crowds have been very well-behaved, and Disney has been very well-organized so far, making for a very smooth morning. 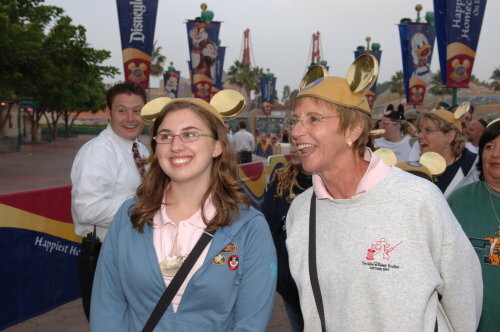 When guests arrived into DCA, they were immediately given their special July 17 golden mouse ears, accompanied by a special July 17 park guide. Just as important, people received color-coded wristbands that gave an indication of the time frame in which they arrived. Crowds are streaming steadily onto Disney property, with a line that snakes several hundred long to get through the security stations. Periodically people are breaking the monotony by doing the stadium wave. In general, everyone seems very excited and there is a definite electricty in the air. Guests of the three on-property hotels have received notices that they must obtain hotel key cards for every individual member in their rooms, including children. These key will ensure re-entry into the park if they close the park on Sunday. 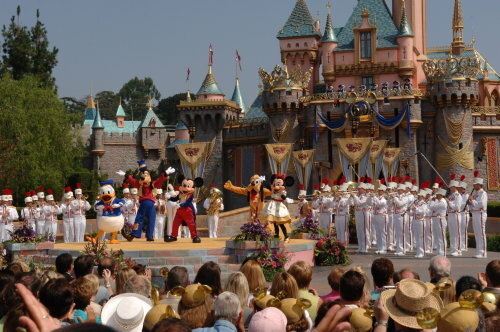 It has been known for a while that Disneyland Resort President Matt Ouimet wants to bring certain Walt Disney World events to California. 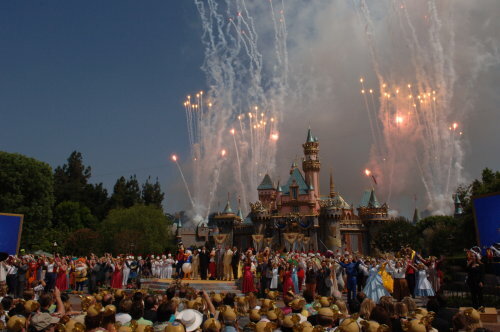 We expected that any such plans would wait until after Disneyland's 50th anniversary celebrations concluded at the end of 2006. We have learned, however, that there has been an internal announcement that an event similar to the Magic Kingdom's Mickey's Not So Scary Halloween Party is in the works for four dates this October at Disney's California Adventure park. The event-specific tickets are tentatively priced at $20 each, with the events running from 7:30 to 10:30 p.m. We will provide details as they become available. It seems to finally be confirmed that the overnight parking lot for people showing up early for July 17's Disneyland celebration will be the Pumbaa parking lot. For those unfamiliar with the area, the Pumbaa parking lot is across Harbor Boulevard from Disneyland off Freeman Way. Exit I-5 at Harbor and drive towards Katella. There will likely be some signs or other help in finding where you need to go. As for tickets, we cannot get a confirmation we are completely happy with, but all appearances are that blockout tickets (for people with Southern California Select, Southern California, and Deluxe annual passes, which are blacked out on Sunday) will not be available for the July 17. If you do not have a Premium AP, you must purchase a regular single-day ticket. This could prove to be incorrect, but do not assume you can show up Sunday to buy a blockout ticket; you should probably be prepared to pay $56 for a regular ticket instead. Another alternative, if you can get to the park today (Saturday, the 16th), is to upgrade your deluxe annual pass to a premium annual pass. This should be cheaper than a single-day ticket and would get you into all the other blacked-out days as well. Mickey and Minnie say "Happy Birthday"
While roaming around Tomorrowland waiting for the Space Mountain event yesterday, Frank ran into Wayne Allwine and Russi Taylor, the voices of Mickey Mouse and Minnie Mouse. They were giving radio interviews, and posed for a picture and were kind enough to wish Disneyland a happy birthday for MousePlanet readers. 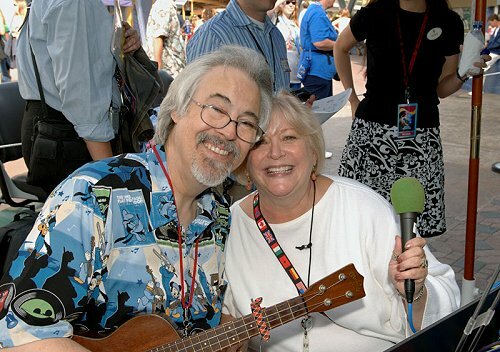 Wayne Allwine and Russi Taylor, the voices of Mickey Mouse and Minnie Mouse, lend their voices for radio interviews during the Space Mountain re-opening celebration. Photo by Frank Anzalone. If you plan to ride Space Mountain this weekend, be prepared to wait. 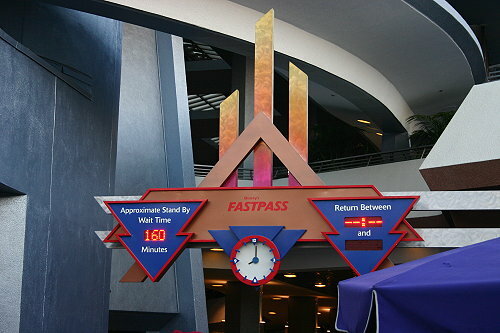 Yesterday, on the day of official re-opening, Fastpass tickets were completely distributed by late afternoon and stand-by times topped out at more than three hours. At 11:25 p.m. (with only 35 minutes left in the park's houses of operation) the stand-by time was still showing as 145 minutes, and people were still joining the line despite a cast member saying that most in line would not get on the ride. Since the ride did not open until 11 a.m. because of the dedication ceremony, part of the crowding may be alleviated by the extra three hours of operation on Saturday and Sunday (as well as by today being a blockout day for Deluxe annual passholders), but that seems unlikely since today is a weekend. At around 8:00 p.m., the stand-by wait was 160 minutes and Fastpass tickets were long gone. Photo by Alex Stroup. 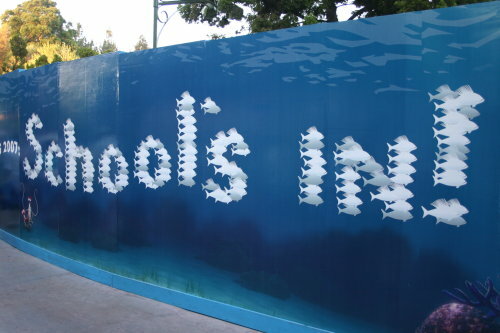 Since it was going to be official by midday anyway, guests entering Disneyland by monorail yesterday were the first to see the newly decorated construction wall around the submarine lagoon. 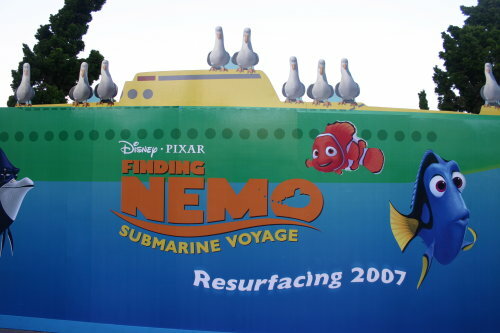 Similar to the wall around Monsters, Inc., at DCA, the wall is now completely festooned with characters from Finding Nemo and the announcement that a new ride is coming in 2007. The main sign, near the monorail ramp. Photo by Alex Stroup. 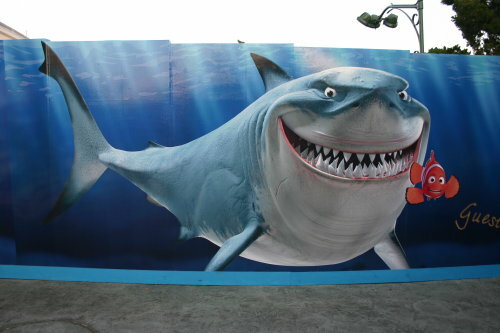 This large image of Bruce (the shark) and Marlin is an instant photo spot. Photo by Alex Stroup. As MousePlanet devoted a fair amount of virtual ink to the concerns and complaints of a portion of the participants of this week's merchandise special event, we thought it only proper to provide an update now that the event has actually begun. The majority of attendees seem very pleased with the event thus far - even those who feared the worst seem to have had their concerns alleviated. The biggest complaints have arisen from the very long lines (up to three hours) during the registration and product pick up process Thursday night, though event planners took steps to reduce the crowding on Friday morning. Though the seminars were said to be sold out, many sessions had empty chairs (likely due to people sleeping in), and those participants who did not get into they session they really wanted were allowed to take any remaining seats on a space-available basis. Some attendees apparently expected more from "Walt's Brown Bag Lunch" than a sandwich lunch served in a paper sack, but the Taste of the Disneyland Resort dinner was very well received. Friday's auction was a success, with many lots selling well above their estimated prices. The Swarovski crystal-covered Mickey Mouse sculpture sold for $35,000, with the proceeds benefiting the Children's Hospital of Orange County. "Surprise" lots included the Alice in Wonderland playing cards that decorated the tarp around Sleeping Beauty Castle during last year's refurbishment ($400-$700 per piece), and props from the Submarine Lagoon, including the cross-eyed Sea Serpent ($3000). Marie Osmond was on hand as her one of a kind Cinderella doll sold for $14,000. (Marie Osmond donated her proceeds from that auction to the Children's Miracle Network). Most of the "experiences" sold at or above their estimate, with the Dave Smith-guided tour of the Disney Archives going for $3,000, the behind-the-scenes Fantasmic! experience selling for $4,000, and breakfast for 12 in Walt's apartment bringing $9,000. Saturday's event schedule includes more seminars, a garden luncheon, artist appearances and a dinner party, all leading up to the main event on Sunday. Disneyland Resort Hotel guests have still not received any word if they will receive priority admission to Disneyland on 7/17, or if they need to leave their warm hotel room and join the line up inside DCA. Some expect that the Disney fairies will leave instructions in their rooms Saturday night, as was done for resort guests prior to the May 4th event. As promised, here are some photos form today's two events. All photos are by Frank Anzalone (since I was standing next to him, it seemed pointless to take any of my own). 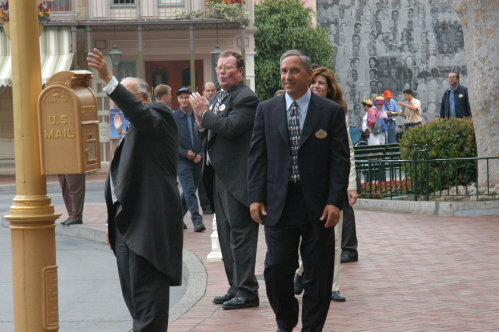 Disneyland Resort President Matt Ouimet. 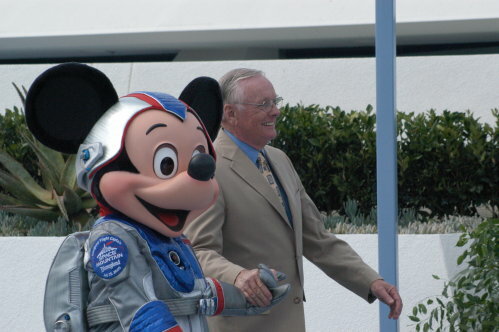 Space Mickey hand-in-hand with astronaut Neil Armstrong. 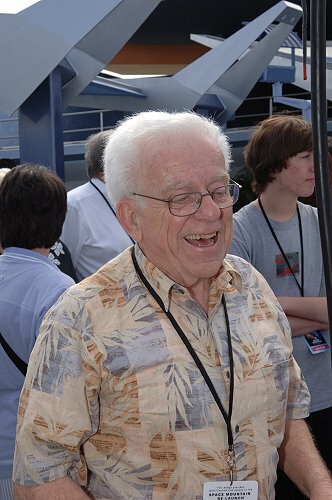 Former Imagineer (and MousePlanet contributor) George McGinnis seems to enjoy his time in the sun, giving several impromptu interviews, signing autographs, and posing for photos. 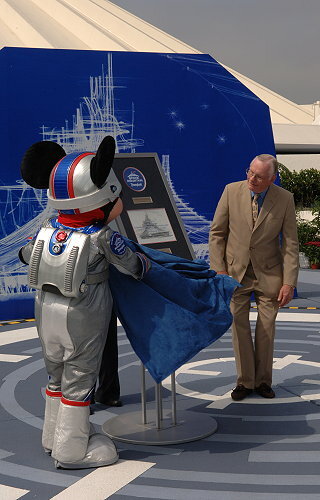 Mickey Mouse reveals the plaque given to Neil Armstrong. 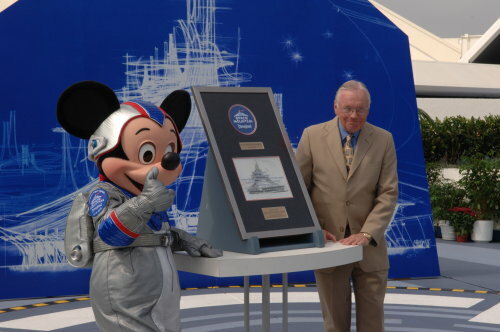 Mickey Mouse and Neil Armstrong pose with Neil's plaque. 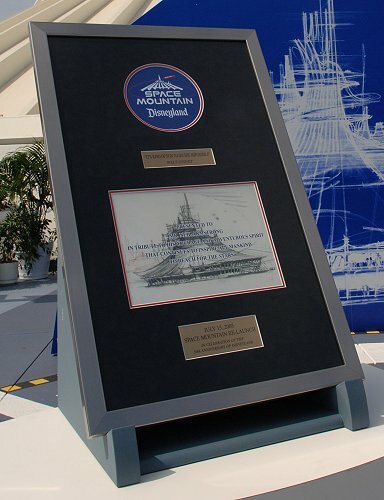 Neil Armstrong's plaque is displayed for viewing, with the Space Mountain in the background. 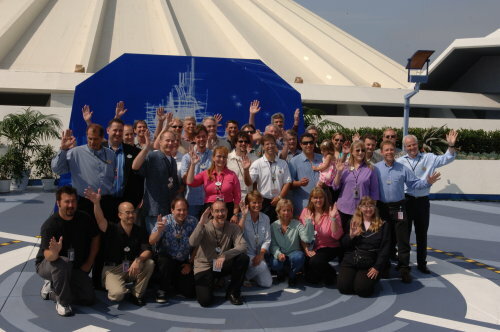 The team from Walt Disney Imagineering who worked on the Space Mountain project. 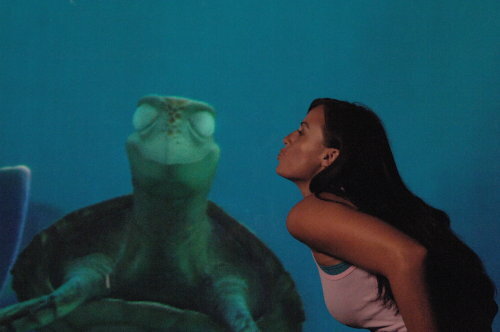 At Turtle Talk with Crush, some moonfish inform the audience that smoking is not allowed. Disney Parks Chairman Jay Rasulo shares a joke with Crush. Crush has many expressions when talking to the audience. Kids sit on the floor in front while watching the show. Olympic swimmer Amanda Beard and Crush discuss who could swim faster (if being chased by a tiger shark). Jay Rasulo and Amanda Beard. Crush reacts while Amanda Beard gives an interview following the show. Crush can't keep his eyes open when getting a kiss. 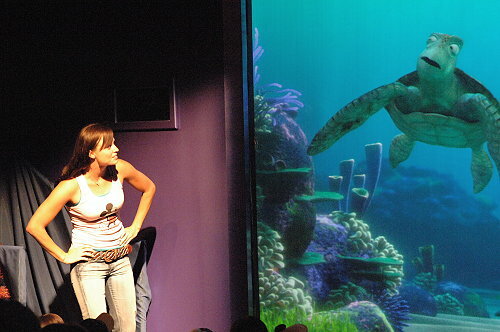 Turtle Talk with Crush is now officially open in the Animation Building in Disney's California Adventure, and Finding Nemo Submarine Voyage is now officially on the slate for a Disneyland opening in 2007 (no more specific date was given. 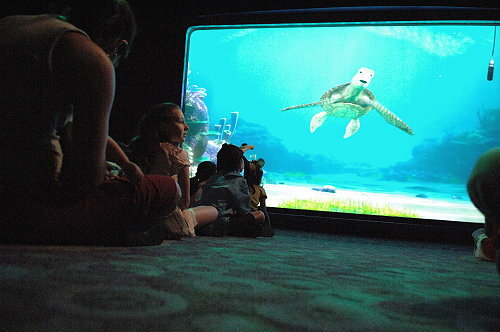 The Turtle Talk with Crush event was even more low-key than the Space Mountain event, though this time some lucky guests were able to sit in. A show cast member was hung out a bit to do some improv while the media took their time setting up and some final kinks in the show were worked out. 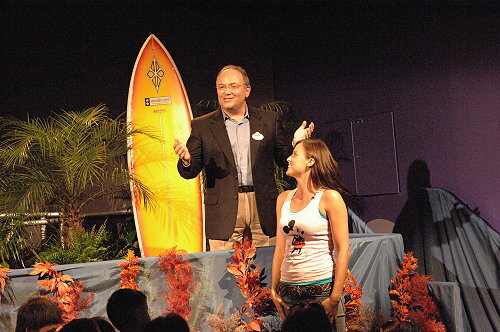 In working the crowd, the CM made a major informational gaffe that separated the Disney fans in the crowd from those just assigned to be there, but it was all in good fun and eventually he was given the green light to start and could return to his script. 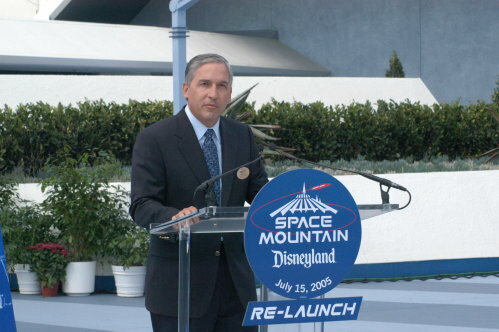 First up was Disney parks chairman Jay Rasulo (a sign of good management, perhaps, that Rasulo was getting the lower-profile event while Matt Ouimet was allowed to emcee reopening of Space Mountain). 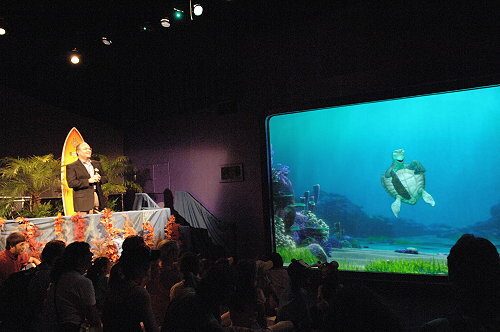 After talking about the magic of Disney he introduced Crush, who swam onto screen and pretty much began to do his normal show (leading the audience through turtle vocabulary, for example). The CM then asked if anybody in the audience liked to swim and whether anybody a fast swimmer. 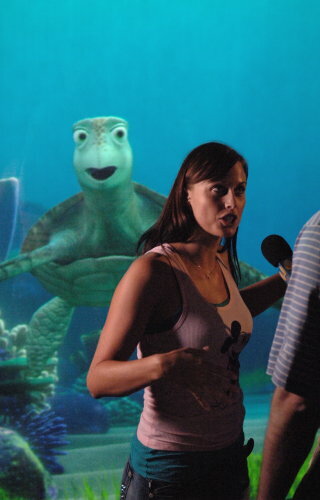 After talking to a couple kids, he picked a woman in the back of the audience who assured Crush that she could, indeed, swim fast. When he asked how she knew, she said that she had won a gold medal in the Olympics. It was Amanda Beard, two-time Olympic gold medalist swimmer. As a member of the sub crew, Guests will embark on an expedition to observe an active undersea volcano. But soon after departure, they will be delighted to discover their favorite fish friends getting into the swim of things right alongside their submarine! 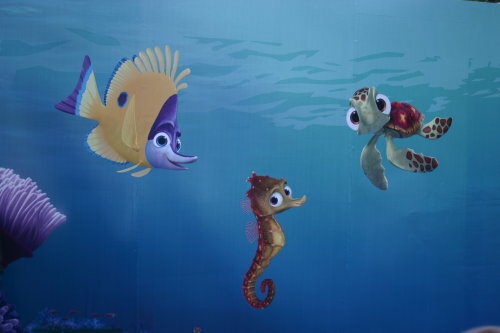 Nemo and his friends are able to go along for the ride thanks to an amazing new projection technology developed exclusively by Walt Disney Imagineering that allows them to appear exactly as they do in the film Finding Nemo but now in a three-dimensional underwater world. It was interesting to hang around after the official presentation, when Amanda Beard and Crush did interviews for television and radio stations. It really showed of the abilities of the computers behind the show watching him stay in character even as the actual words drifted far from the show's script. Stay tuned: You can expect photos from today's two events later today. 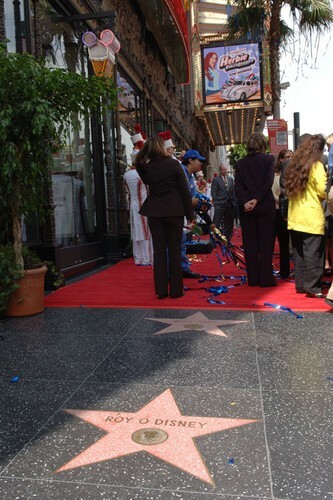 I've been informed by email that the photo from the Walk of Fame event misidentified the two city councilmen in them. They were not Anaheim councilmen but rather Los Angeles City Council members Eric Garcetti and Tom Labonge. Our apologies for the misidentification. In a short 13-minute ceremony, Space Mountain officially reopened at about 10:20 this morning. The ceremony was held on the upper platform out of view of regular park guests. In attendance were a small crowd of invited guests (including retired Imagineer George McGinnis, who worked on the original Space Mountain design), the Imagineers who worked on the redesign and reconstruction. And of course a small gaggle of press. Unlike on May 5th, the press's presence in the park is much more understated with a small row of radio booths surrounding the former Radio Disney broadcast booth in Tomorrowland. The ceremony itself began with Disneyland Resort Ambassador Becky Phelps welcoming every body and introducing Resort President Matt Ouimet. Matt Ouimet spoke about how popular Space Mountain is and called it "the ultimate E-Ticket." Noting Walt Disney's involvement with rocketry pioneer Werner von Braun, Ouimet then brought out astronaut Neil Armstrong, the first man to walk on the moon. Armstrong walked on stage in the company of Space Mickey and deferred to Mickey saying he always "respects his elders." In his remarks, Armstrong drew a connection to the current space shuttle launch noting that both were returning after a period of reconstruction, redesign, and improvement. He also spoke of how he returned from his time serving as a Naval pilot to find that TV has blossomed, and on this TV was Walt Disney's Wonderful World of Color with its periodic segments on space flight. At the time, he said, everybody was fascinated by the possibility of space flight but nobody really thought they'd see it in their lifetimes. 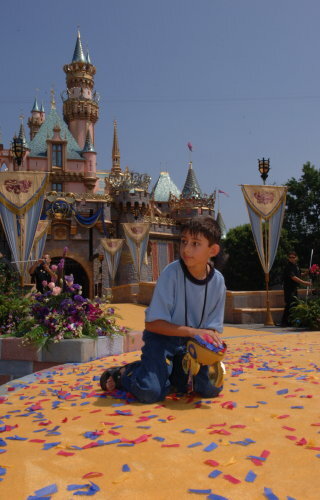 Disney, he said, imagined it and when we actually did it just a few years later, Disneyland was there to celebrate it. After his remarks, Matt Ouimet came back on and presented a plaque to Neil Armstrong commemorating the moment. 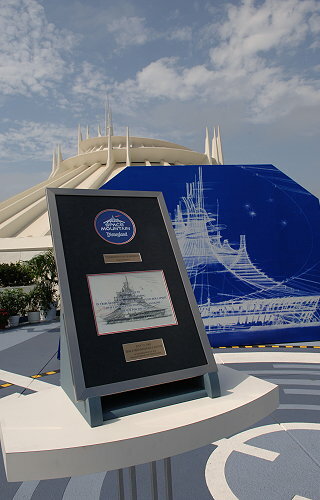 Over John Hench's original conceptual drawing of Space Mountain, the plaque reads: "Presented to Mr. Neil Armstrong in tribute to his courage and adventurous spirit that continues to inspire all mankind to reach for the stars." It also includes the quote by Walt Disney that "it's kind of fun to do the impossible." That was the whole ceremony, and afterward many of the Imagineers who worked on the reconstruction project gathered for a group shot. We'll post photos from the ceremony later in the day. 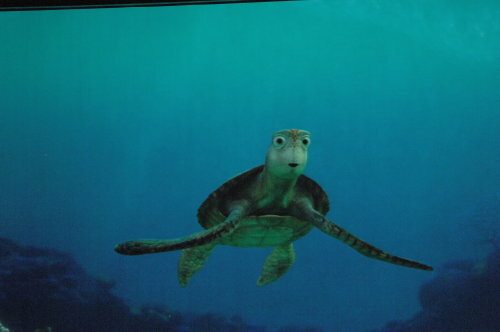 Right now, I'm waiting to get into the Turtle Talk with Crush ceremony. 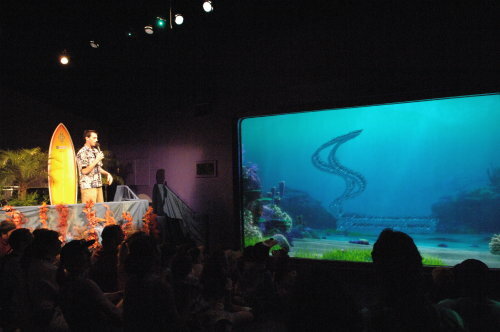 At the end of that "Finding Nemo Submarine Voyage" will be officially announced. 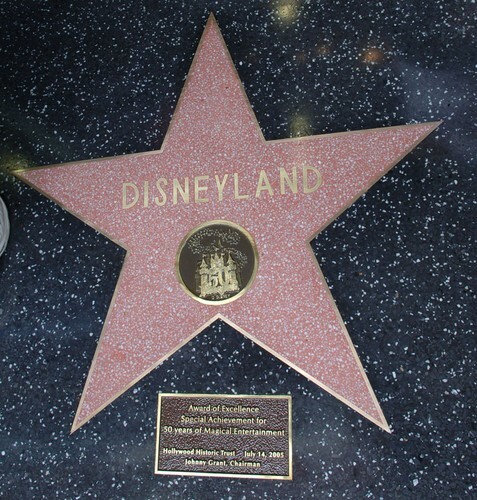 Yesterday at 10:30 a.m. in Hollywood, Disneyland received a star on the Hollywood Walk of Fame. On hand were Michael Eisner, Robert Iger, honorary Hollywood mayor Johny Grant, members of the city council and 50 Disney characters. Most of them (except the characters) gave speeches and the event was quick and smooth. Following are some pictures of the event by Frank Anzalone. 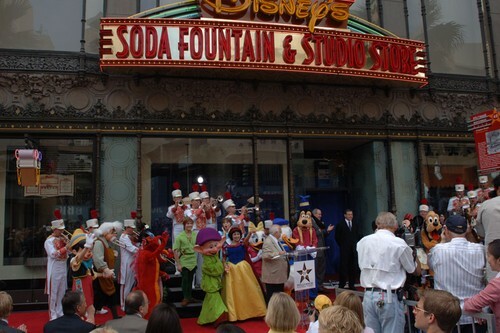 The star, which is right outside the Disney-owned El Capitan theater is not far from other Disney-related stars, particularly the one for Roy O. Disney (Walt's brother, not Roy E. Disney, recently making nice with the company). 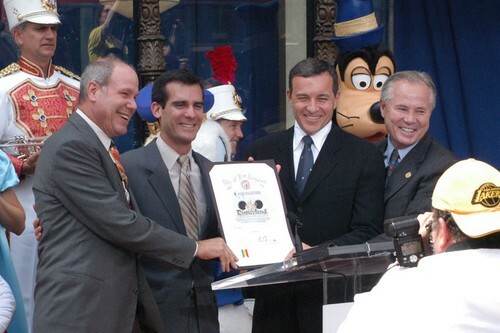 Michael Eisner, Robert Iger, and Los Angeles City Council members Eric Garcetti and Tom Labonge. Photo by Frank Anzalone. 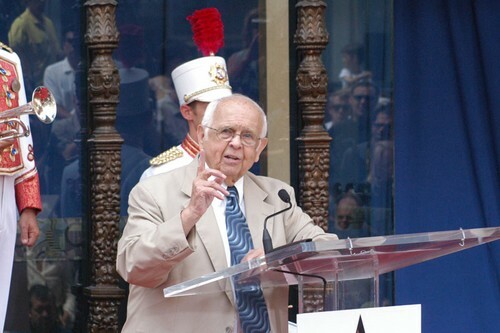 Longtime honorary mayor of Hollywood, Johny Grant, getting his moment to speechify. Photo by Frank Anzalone. 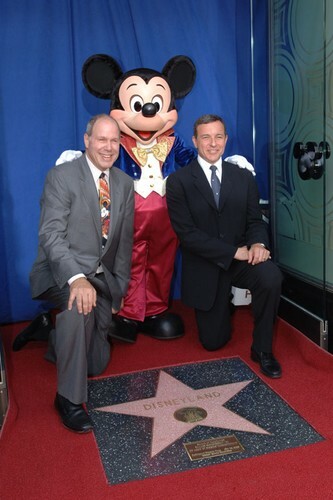 Michael Eisner, Robert Iger, and Mickey Mouse with the new star on Hollywood's Walk of Fame. Photo by Frank Anzalone. Some of the Disney characters on hand for the ceremony. Photo by Frank Anzalone. 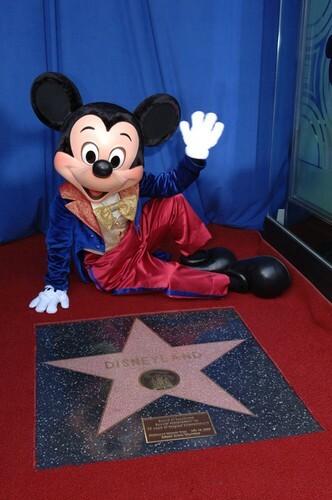 Mickey Mouse posing with Disneyland's star. Photo by Frank Anzalone. Disneyland's star. This was a special award, not one of the regular stars which are awarded in one of five categories. Photo by Frank Anzalone. Roy Disney's star is only a few feet away. Photo by Frank Anzalone. 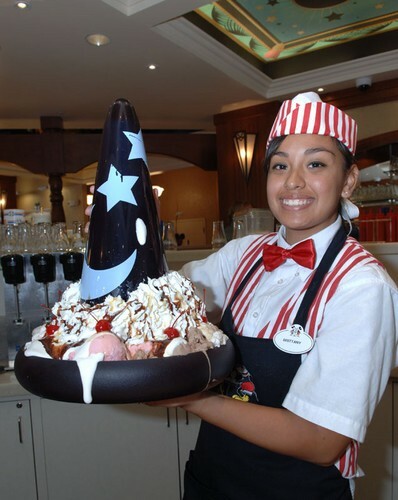 If you visit the star, you can always follow up with a sundae at the new ice cream and soda fountain next to the El Capitan theater. Photo by Frank Anzalone. 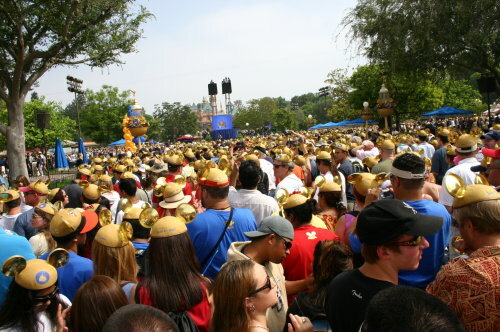 Welcome to MousePlanet's coverage of the events surrounding the real birthday of Disneyland. Throughout the weekend we'll be updating this page whenever we feel there is something to share. We expect this will include photos from yesterday's ceremony in Hollywood where Disneyland received a star on the Walk of Fame. Later today we'll have coverage of the official openings of Space Mountain in Disneyland and Turtle Talk with Crush in Disney's California Adventure. Over the weekend we'll have photos and stories from a benefit aboard the Disney Magic cruise ship, the scene as people line up for the 17th, and then anything of interest that happens on the 17th itself. So, if you can't celebrate at Disneyland yourself, check back on this page regularly to at least know what's going on. Just a refresher on what will be happening overnight on the 17th. Disney's California Adventure will open at some point in the middle of the night. The information on this is slightly different as to whether it will open at 2 a.m. or 3 a.m., but it will open. We're still being told that the Timon parking lot will be open, but if it turns out to be Pumbaa, then there'll certainly be help in figuring it out. When you enter DCA to line up, you will be issued a wristband. If you leave DCA for any reason before moving over to Disneyland, you'll have to surrender the wristband and get a new one if you return, and also go to the end of the line. It needs to be emphasized that Disney is treating this as a line, not as a party. You'll be expected to stay in line and only leave to use the restroom or purchase food. Don't bring in anything elaborate for sleeping or sitting as it may be rejected as the security station. If you are not inside of DCA by approximately 6 a.m., you'll have to wait outside of the bag check stations until after everybody in DCA has been moved to Disneyland, which will be around 7 a.m. and could take up to an hour. You should also be aware that for the day the Festival Arena (at the back of Frontierland) will be converted into a large temporary merchandise area, and this is where the limited edition pin releases will be handled. If any of this information changes (and it very well might), we'll post updates to this page. Finally, if you will be in the park on the 17th, consider stopping by the lower deck of the Hungry Bear Restaurant around 3 p.m. In addition to it being Disneyland's 50th birthday, the 17th is also MousePlanet's 5th birthday. We'd love to meet any readers in the park.